To be elected as an OA member, a youth must be a registered Boy Scout and hold the rank of First Class or above. Fifteen days and nights of camping must be completed which includes one (but not more than one) five day long-term camping period. Scouts are elected to the Order by their fellow scouts, following approval by their unit Scoutrnaster. Click for the 2018 Election Worksheet. This PDF fillable worksheet can be provided to the Scoutmaster to be filled in ahead of time or be used by the election team to enter the eligible scouts names in the fillable form. Once the form has been completed, a ballot will automatically be created on the second page. This ballot can be printed out and copied to be used in the troop election. Printed ballots have a MUCH higher success rate than 'write-in' ballots and are more fair to the youth that might not be physically present during the election. After the election, please have the 2018 Election Worksheet signed by the Scoutmaster and Election Team. Please provide the unit leader a copy of that form (could be at a later date). The Chapter Adviser will use the worksheet to enter the necessary information into the Chapter's online Elections Results Form. With Unit Elections come Adult Nominations. We've had significant misunderstandings across the Lodge and Chapters for several years. The Adult Nominations process changed significantly in 2012 and the Lodge needs to update as well. Please hand out the new "2017 Adult Nominations Form" during elections. 1. Selection of the adult is based upon their ability to perform the requisite functions and not for recognition of past service, including current or prior achievement and position. 2. The individual will be an asset to the Order due to demonstrated skills and abilities which fulfill the purpose of the OA. 3. The camping requirements set forth for youth members are completely fulfilled. 4. The adult leader’s membership will provide a positive role model for the growth and development of the youth members of the Lodge. 5. The unit has held a youth election that same calendar year. 6. See PART C below. 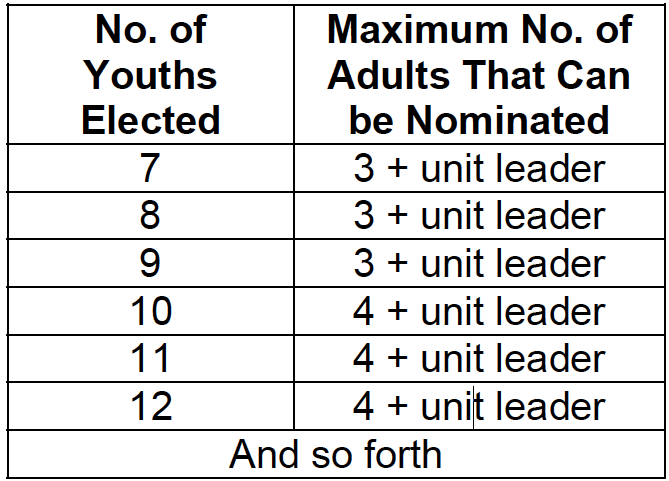 Adult Nominations ratios:The number of adults nominated can be no more than one-third of the number of youth candidates elected, rounded up where the number of youth candidates is not a multiple of three. 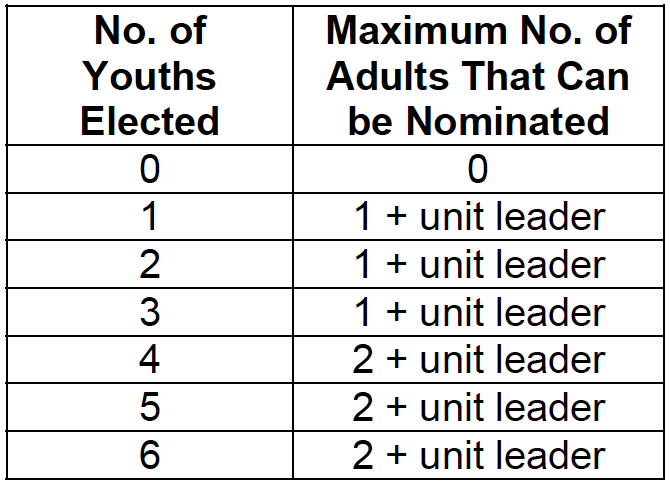 In addition to the one-third limit, the unit committee may nominate the currently-serving unit leader (but not assistant leaders), as long as he or she has served as unit leader for at least the previous twelve months. 1. All requirements previously set forth in Paragraph A for adult leaders in units shall be fulfilled. There is an exception concerning the camping requirement which may be waived at the discretion of the Lodge Adviser or Council Executive. 2. The selection of an adult member shall be at the complete discretion of the Adult Selection Committee, who shall vote regarding the approval or disapproval of each proposed candidate. 3. An adult who holds a registration in a Troop and in a District or Council position must be nominated from the body where the primary registration is held. 4. See PART C below. 4. The Committee will work directly with the Chapter Adviser and approve/dissaprove and then inform the candidate.